OPPO Digital's long anticipated, audiophile fabulous BDP-95 is finally available. When the highly acclaimed BDP-83 Special Edition was discontinued and the BDP-95 announced, there was a lot of speculation floating around. Would the BDP-95 be a worthy successor? Would it simply add streaming capabilities to the prior model or rather bring the performance up a level? • Read more Blu-ray player reviews by the staff at Home Theater Review. • Find a Plasma HDTV or LED HDTV to pair with the OPPO BDP-95. Unless you are brand new to home theater, you likely know about the above speculation and are aware of OPPO Digital's role as the company that offers products that provide high performance levels at reasonable prices. 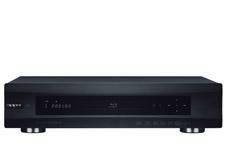 Two years after introducing their first Blu-ray player, OPPO Digital remains on the performance forefront with the introduction of the BDP-95. The BDP-95 is the successor to the BDP-83 Special Edition with the addition of 3D and streaming capabilities. At $899 the BDP-83 Special Edition set the performance benchmark in its price category (and well above). The BDP-95 is slightly more expensive at $999 and for reasons you will read about below, remains the universal disc player benchmark for audiophiles. As the BDP-83 Special Edition was the performance version of the BDP-83, the BDP-95 is the audiophile version of the BDP-93. The video and digital audio circuitry is the same in the two units. The differences lie with the analog audio performance. If you are only going to use the digital outputs, save some money and buy the BDP-93 (or spend the same amount of money and get two BDP-93s). You can learn all about the BDP-93 from Adrienne Maxwell's review. Unlike the BDP-83 Special Edition, the BDP-95 features a different chassis than the model from which it was developed. Accordingly, it is not possible to upgrade a BDP-93 to a BDP-95. At sixteen pounds the BDP-95 weighs five pounds more than the BDP-93 and was the first thing I noticed when I removed the tote bag ensconced player from its Apple-like packaging. Upon opening the bag I was greeted by a front panel unlike any other OPPO panel I have seen. The heavy gauge metal front panel is finished in an attractive matte black finish with bevels along the top and bottom edges. The majority of the front panel is occupied by a glossy black panel that hides the disc tray and transport controls. The panel is flanked on the left by an OPPO badge that doubles as a power button and a covered USB port on the right side. The rear panel has the same plethora of connections as the BDP-93: dual HDMI v 1.4a outputs, stereo and 7.1 analog outputs, component and composite video outputs, IR input, RS-232, digital outputs, USB and eSata connections with the notable addition of balanced stereo outputs. While OPPO advises that there are a host of component upgrades distinguishing the BDP-95 from the player it was based on, there are two that stand out and immediately caught my attention. The first are the DACs. The BDP-95 features two of ESS Technology's newest high performance DACs - the ES9018 SABRE32 Reference Audio DAC, one for the 7.1 output and the other for the dedicated stereo output. The second is the toroidal power supply custom designed and built for OPPO by Rotel. As most audiophiles know, power supplies can have a huge impact on analog audio performance. More on both of these features later. As with its spiritual predecessor, the BDP-83 Special Edition, the BDP-95 utilizes ESS Technology DACs in the special edition in place of the Cirrus Logic CS4382 units in the standard version (same as in the prior BDP-83) and an upgraded power supply. While ESS Technology was a relative newcomer to the high performance audio market when I reviewed the BDP-83 Special Edition, it now has an established and growing following, giving the old line chip companies a run for their money. The BDP-95 incorporates two of the eight channel ES9018 Sabre(32) Reference DACs. One DAC is utilized for the stereo output and another for the 7.1 channel output. The stereo output effectively stacks four DACs together to maximize performance. As with ESS Technology's prior DAC (the ES9016), the ES9018 Sabre(32) Reference DAC claims to differ from conventional sigma-delta DACs, incorporating patented circuits specified to provide up to 135dB dynamic range and -120dB total harmonic distortion plus noise (compared to 128 dB and 110 dB for the prior version). ESS Technology touts the following features: a 32-bit HyperStream modulator that is capable of 100 percent modulation and unconditional stability; a Time Domain Jitter Eliminator to "provide unmatched audio clarity free from input clock jitter;" Revolver Dynamic Element Matching to increase performance over a wide dynamic range; support for incoming audio up to a 500kHz sampling rate in PCM, DSD and SPDIF formats, and; customizable signal processing. The ES9018 Sabre(32) Reference DAC retains the flexibility of its predecessor in that it can be configured for either Quad Differential Stereo or 7.1 channel modes. OPPO uses both modes in the BDP-95 with one each of the two DACs programmed for stereo and multi-channel. As with the BDP-83 Special Edition, the BDP-95's stereo output is fed by a DAC configured in Quad Differential Stereo mode. However, there is a notable improvement with the BDP-95 other than the evolution in DAC technology discussed above. With the BDP-95, this balanced audio signal that flows from the Quad Differential Stereo mode DAC can actually be output as a balanced signal. Many of you are familiar with some of the more prominent aftermarket modification companies. These companies flocked to the prior OPPO player and many of these modifications focused on upgrading the power supply. With the BDP-95, the power supply already comes upgraded. While I am sure that many of these companies will still develop upgrades, they will have to work harder to do so as the Rotel Toroidal based power supply is a significant upgrade from prior offerings. The BDP-95 is equally at home in either a reference stereo system or a multi-channel home theater. I used the player in both settings. All of my listening for this review was through the analog outputs, as the performance through the digital outputs should be no different than that of the previously reviewed BDP-93. The BDP-95 replaced the BDP-83 Special Edition in my theater system. It fed my Anthem D2V preamplifier / processor via HDMI, component video and analog 5.1. Amplification is courtesy of Halcro's MC70, although I did use a Wyred 4 Sound amplifier in for review towards the end. Video is provided by a Marantz VP-11S2 projector and Stewart Filmscreen Studiotek 100. My speakers include Martin Logan Summits, MartinLogan Stage and a Paradigm Sub25. All cables were from Kimber with the exception of the 5.1 cables. The 5.1 cables were comprised of three pairs of Ultralink's Platinum series interconnects. All of the multi-channel listening for this review was done through the 7.1 channel analog output. I was able to use the BDP-95's cross-over to adjust the settings for the rear speakers and subwoofer as they now allow the selection of cross-over points, a welcome addition. I connected the BDP-95 to my reference stereo system through its dedicated balanced stereo output. This system is currently comprised of McIntosh Laboratories C500 and MC501 preamplifier and amplifiers, respectively; and MartinLogan Summit speakers. All cabling was Kimber Select. Power conditioning was by a Richard Gray RGPC 1200 unit. The BDP-95 comes with OPPO's now familiar "Easy Setup Wizard." With one exception, I found the Easy Setup Wizard to be informative and easy to use. My theater system is not 3D capable so I did not have a need for the dual HDMI outputs. (Adrienne describes how dual outputs can be beneficial in her review of the BDP-93.) However, if I wanted to use both outputs, their setup would be more confusing than I have come to expect from OPPO. The player has two HDMI connectors, labeled "HDMI 1" and "HDMI 2." The BDP-95 also has two groups of HDMI settings, again labeled "HDMI 1" and "HDMI 2," the rub being that these settings do not necessarily correspond with the connections on the back. It seemed a bit confusing to me and I am sure it will be to end users as well. However, OPPO assures that the answers lie within the User's Manual. Lastly, I used a wired Ethernet connection as I already have cables run to my equipment rack. For those of you who do not have such cabling handy, the BDP-95 comes with a wireless 802.11 N adapter which can plug directly into the back of the player or into the included extender cable. I acknowledge that the external wireless adapter may not be aesthetically pleasing to some, but I much prefer to have wireless transmissions emanating from outside the chassis than directly next to sensitive audio components. Before getting into the audio performance, I must point out that the BDP-95 had an entirely new way of being used, as a streaming device. When I reviewed the BDP-83 I lamented the lack of streaming capabilities. The BDP-95 can access the following streaming services: Netflix, Blockbuster, VUDU, Film Fresh and photo-sharing site, Picasa. As this player handles nearly every format, this section would be painfully long if I were to delve into detail for all of them. Accordingly, I will focus my review of the BDP-95's performance on the audio features that make it special. Read more about the performance of the OPPO BDP-95 on Page 2.